In Thailand, close to the beach from Pattaya, we rent out luxury vacation homes. All are centrally located, just minutes from the beaches and the city of pattaya, close to nice restaurants, bars and supermarkets. Near our vacation homes you will find beautiful beaches, shopping centers, restaurants and the vibrant nightlife from Pattaya with his famous Walking Street, Soi LK Metro, all just minutes away. For those who prefer a little more peace, Jomtien is a great place to be, with a long boulevard, many terraces, wonderful restaurants and small shops to spend the day or evening. All our vacation homes have a large living room with beautiful kitchen, spacious bedrooms with air conditioning and ensuite bahtrooms. Outside on the patio you will find tables and chairs but also a BBQ. 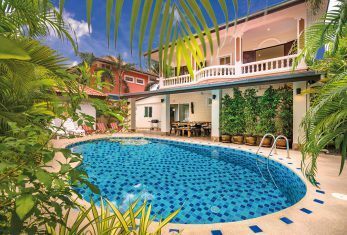 Enjoy your private pool, tropical garden and be surprised by the beautiful surroundings of our vacation homes in pattaya.